Welcome to Merton Windows and Doors – Surbiton and Berrylands glazing specialists! We supply and fit a whole range of high quality products, made to measure to your exact specifications, including bespoke sash windows, casement windows, timber windows and aluminium windows. We provide our customers with market-leading products and excellent customer service and our skilled workman will ensure every installation runs as smoothly and efficiently as possible. We pride ourselves on offering a personal touch and always going the extra mile to build strong relationships with our customers. We are aware that having workmen in your home or workplace can sometimes be disruptive, which is why we always do our very best to work around you and always leave your property spotless after any installation. We have expertise with properties old and new and have worked on large commercial projects, so we can ensure every detail is catered for. You may know exactly what you need, but if not, our expert team will always be happy to guide you through the process of choosing your new windows or doors. As well as sash windows and casement windows, we deal with all types of glazing products, including bi-folding doors in Surbiton. 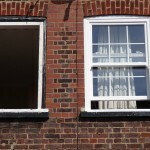 If you would like to talk to us about your new windows, please call us today on 0208 542 2233. We are always happy to offer free quotations, with no obligation to buy and we will never use hard sales tactics. Sash windows have been a common choice for window designs because of their elegant aesthetic but in the past, due to their slight design flaws, this has resulted in them being prone to draughts rattling and getting stuck when opening and closing. 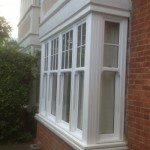 New technology and precision engineering has resolved these issues and we can supply and fit box sash windows that keep the charm of the original design alive, whilst also offering all the benefits of a more modern product. With our sash windows, even new build homes will achieve an elegant look, appeal and charm that properties with sash windows are synonymous with. 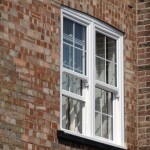 uPVC sash windows: Unlike its timber-framed predecessor, modern uPVC equivalents reduce maintenance to a minimum, provide eye-catching appeal and have high weather performance characteristics. 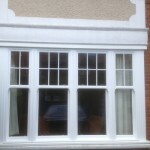 Our uPVC sash windows also offer excellent security features. Read our blog on 10 reasons to switch to uPVC. 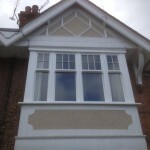 Timber sash windows: Whilst the popularity of uPVC sash windows has grown, many people wish to replace their sashes with timber vertical sliders. If you wish to maintain the authentic look of your property and respect the original fabric of the building, these are the perfect choice. Timber is a much more environmentally-friendly choice than uPVC and timber has innate durability, so they will last longer. Aluminium sash windows: Aluminium is durable, strong and maintenance free and can offer slim sightlines and a huge range of colour options. 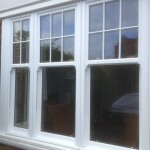 Triple-glazed sash windows: As well as double-glazed sash windows, can can install triple-glazed sash windows for huge energy reductions and excellent noise reduction. Please ring 0208 542 2233, email [email protected] or fill out a simple online enquiry form and we will call you back.